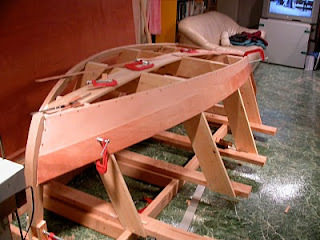 The Unlikely Boat Builder: Over The Hump? It's become something of a joke between Helena and me. More times than I want to remember, I've marched triumphantly up the stairs from my basement workshop and announced, "I'm over the hump! I've just finished what must be the hardest part of building this boat. It's all down hill from here! Yahoo!" 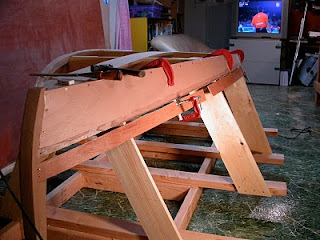 I said it when I finished lofting the plans, when I finally got up enough nerve to buy some 'real' wood, when I finally got up enough nerve to actually cut that 'real' wood, when I figured out how to mount Cabin Boy's stem and transom (oh, bitter irony! ), when I figure out how to cut the stem rabbet, when I finally learned how to spell 'rabbet', etc., etc. I said it again just last week, when I had both garboard planks bedded and fastened. "That was the hump," I announced. "Everyone says the garboards are the hardest part. It's all down hill from here! Yahoo!" And who can blame me? Spiling those garboards really was hard. Such a complex shape and such a demanding technique. The rest of the planks looked simple in comparison. 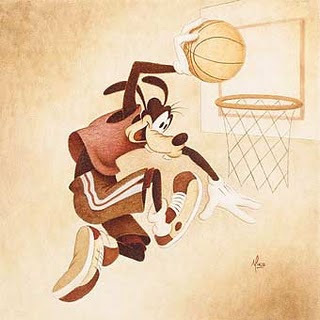 A slam-dunk, as intelligent people used to say. On my first attempt at spiling the second plank, I was so confident that I ignored my own advice and tried to spile the hood end, rather than using a pattern. I figured a little audacity was justified. I'd already mastered the art of spiling, after all. Why keep making hood-end patterns if you could spile them, instead? It was worth a try, I figured. The result? Disaster, of course. After unspiling the points I ended up with a pattern for the second plank that didn't fit at all. Not even close! No problem, I'd just do it again. But again, after unspiling the points, the resulting pattern fit like an unruly banana, curving in the wrong direction. Clearly, I was doing something wrong, but what? After a long session in my 'thinking chair', I decided that the problem must have something to do with the angle of the batten. My narrow battens lay directly on the forms, whereas the full-size pattern lay on the beveled garboard. But I suddenly knew what would work! 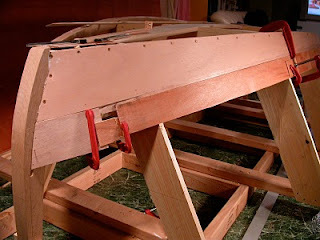 The secret to happy spiling -- wide battens! I tossed the narrow spiling batten into my kindling box, and cut out the widest 3-part spiling batten that would fit between the lap lines. This spiling batten was wide enough to lay on the garboard bevel, just like the plank would have to. 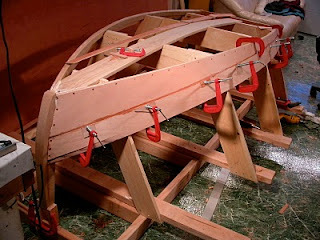 So the batten would lay on the forms at the same angle as the plank would. This angle, I reasoned (hoped? ), was vital to accurate spiling. Success! The unspiled pattern fit perfectly. It followed the laplines, both top and bottom, and lay flat on the forms, with no edge setting. Once you have an accurate pattern, the rest is simple. I traced the pattern onto my sheet of marine plywood, cut the plank out with a jigsaw, and remembered to cut the gains. I tried it on the forms, and it fit perfectly. With the second row of planks screwed and glued, I climbed up the stairs and found Helena behind her piano. "I'm finally over the hump," I mentioned casually. "It's all down hill from here." "Yahoo!" she said, with a smile. You're discovery of how to compensate for the angular difference of how the plank lays upon the lower lap was indeed critical to getting a good spile. I've wondered from the start whether your spiling technique, using crossed pencil lines would be accurate enough. Yes, I know it is one of the techniques in Greg's book, but he also suggests another technique, and having worked beside him, I heard him say the other technique is more accurate. The other technique depends on well marked vertical lines at each station, right down the middle of your station frames. Maybe you use those, but I can't see them in your photos. 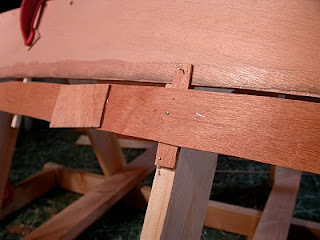 After attaching the spiling batten, transfer those vertical lines to the spiling batten (and upward onto the lap you've beveled on the previous plank. Then, use a dividers with sharp points on each leg. At each station, place one point of the dividers exactly on the vertical line at the base of the lap. 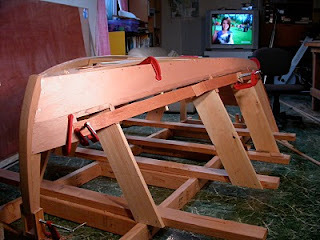 Press the other point into your spiling batten. I make this point to the left of the vertical and mark an arrow pointing back toward the origin point. Next, move the dividers to the other edge. Set a point exactly on the vertical at the next plank line. Press the other point into the spiling batten, but this time to the right, and mark with an arrow. To unspile, fix the spiling batten to the the plank material. Transfer those verticals, extending them as needed for plank width. Unspile with the dividers, marking target points exactly on the vertical lines. The accuracy is better because dividers with two points are usually more robust than dividers that hold pencils, and there's no wearing down of lead, which is good for up to 1/8 inch of inaccuracy. It shows a spiling batten clamped in place, a couple of station lines marked across it, and a few of the points with arrow markings. I also found it helpful to temporarily attach a batten across the next plank line, and measure to the inboard edge of that batten. Good to see you movin' along. More "Yahoos!" to come. Bob: I am pretty sure the geometry used in my spiling method is accurate enough, as long as the pencil lines cross at near right angles when unspiling. As accurate as the thickness of the pencil, anyway. The other problems I've had swamped out this tiny error by several orders of magnitude. The error caused by not having the spiling batten at the right angle was around 3" at the transom. Edge-setting the spiling batten gives similar errors. Love this blog! Keep it up, John!